There’s hardly enough room to turn around in Livin Farms’ office. Pretty standard, really, in Central, Hong Kong, where space is at a perpetual premium. It’s a small operation for the HAX-backed startup — there’s space for a few desks and not much more. The startup’s last product, the Hive, stands next to the door. It’s a series of innocuous trays stacked atop one another. But it’s the Hive Explorer I’m here to see. The small tray sits in the middle of the room. Its top is open, the brightly colored bits of plastic drawing the eye from the moment you step through the door. Its contents pulsate with strange, random rhythms. Upon closer inspection, the browns are whites and blacks are alive, a small bed of mealworms wriggle atop one other, chowing down of the remnants of oats left behind by the team. Above them, a neon yellow tray houses a trio of fully grown beetles and a couple dozen pupae. The former are constant on the move, butting up against one another and sometimes doing more with aims of continuing the life cycle. The pupae lie around, seemingly lifeless, occasionally twitching out a reminder that there’s still life inside. The Explorer finds Livin Farms broadening its horizons into the world of STEM education. Where past products were focused on scalable sustainability, the new Kickstarter project is firmly targeted at youngsters. And there’s a fair amount to be learned in the bucket full of beetles. Mortality, for one. Founder Katharina Unger grabs a nearby jar and twists off the cap. It’s filled to the top with dried mealworms. She pulls one out and pops it in her mouth, handing it to me, hopefully. I follow suit. It’s crispy. Not flavorless, exactly, but not particularly distinct. Maybe a bit salty. Mostly it just feels overwhelmingly morbid, showing down on on a little larva as its brothers continue to feast a few inches away. Protein source of the future, now, to quote The Mountain Goats. 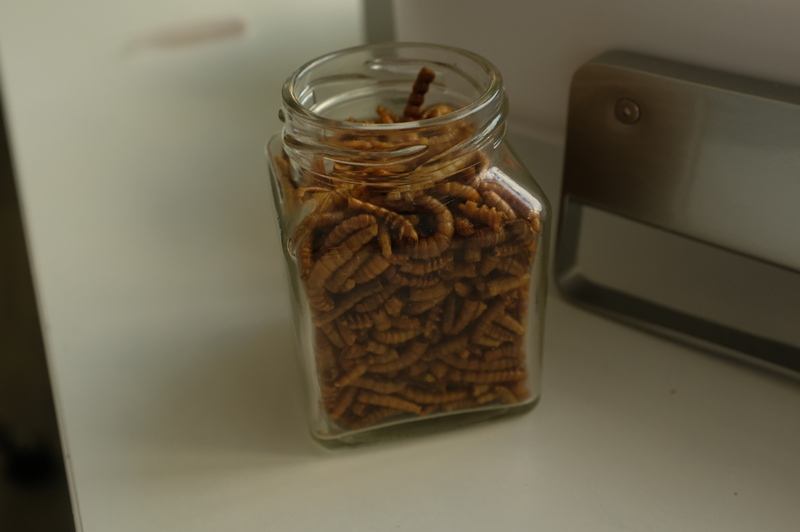 Livin Farms also produces a unflavored larva-based powder and a surprising tasty granola as a kind of proof concept for its sustainable high-protein foodstuffs. The mission hits home here in one of the world’s most densely packed places. The Explorer also offers youngsters a peak at what many consider the future of sustainable farming — assuming food manufacturers are ever able to break through the stigma of eating insects. Kids are encourage to harvest the larva to avoid overpopulation with a bit of dry roasting. 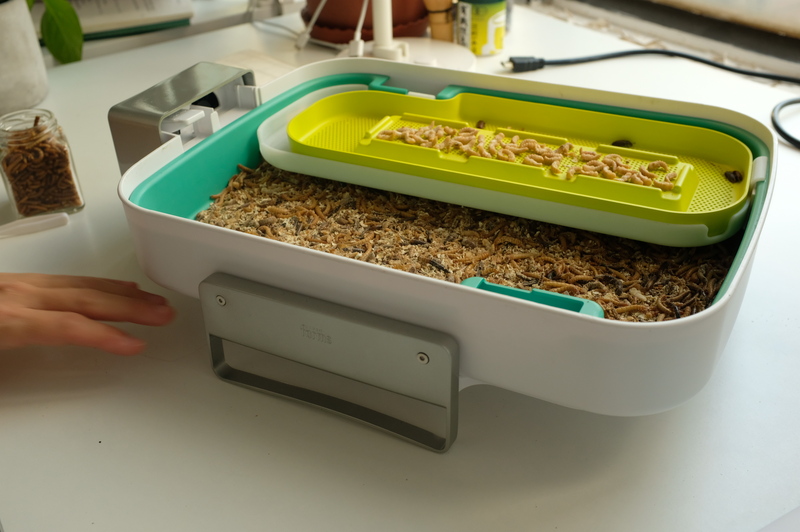 The box serves as a relatively odor-free form of composting. Feeding the bugs simply entails tossing excess foodstuffs into the bin. The little buggers will tear through it, leaving a thin powder of waste in a tray below. The setup also features a heat plate to keep the worms warm and a fan to regulate humidity, assuring that settings are ideal for the beetles to do their thing. Livin Farms is also opening up the controls to the system via Swift, in an attempt to bring a coding component to the system. The Explorer went live on Kickstarter this week. Early bird pledges can pick up a the box of worms for ~$113.